Depending on the specifics and time of year of your proposed event, Restaurant Sainte-Marie can be rented for your corporate party, BBQ, wedding reception, family function or small conference. During evenings and select times through the late fall, winter and early spring, you can enjoy the unique setting of Restaurant Sainte-Marie. Please note throughout the day during our operating season, private receptions and special occasion functions cannot be booked in Restaurant Sainte-Marie. However, opportunities may exist during the operating season daily before 10:00 a.m. and after 5:00 p.m. Please note that a rental of the restaurant includes the room and base amenities such as tables and chairs set to your needs. Additional charges will apply if your event requires meals, extra staffing, security or specialized room amenities, among other features. Please contact the restaurant for more information. Enjoy the relaxing atmosphere of this 17th-century styled room and its bright outdoor patio. The Restaurant can accommodate up to 175, and the outdoor patio has a capacity of 60 persons. While we welcome wedding receptions, please note wedding ceremonies are not permitted in the restaurant, on the patio, or on the historic site. 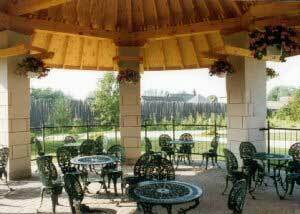 Restaurant Sainte-Marie offers visitors a marvelous selection of traditional Canadian cuisine, including casual and fine dining for every taste. A wide selection of beverages (we are fully licensed) is available. Enjoy the comfort of air-conditioning, or relax outdoors on the partially covered patio. Please contact Nick Boudouris at Restaurant Sainte-Marie for further information.